The weather here in So Cal, has been anything but fall like. The past 2 weeks have been so hot and summer like I been a total bum in the way I dress. Since my accident at work and ankle sprain I have been in a total fashion slump. So between the my bad ankle and the heat, me and fashion have not been friends. Last night it cooled down enough that I jumped at the chance to wear some of my new fall clothes. 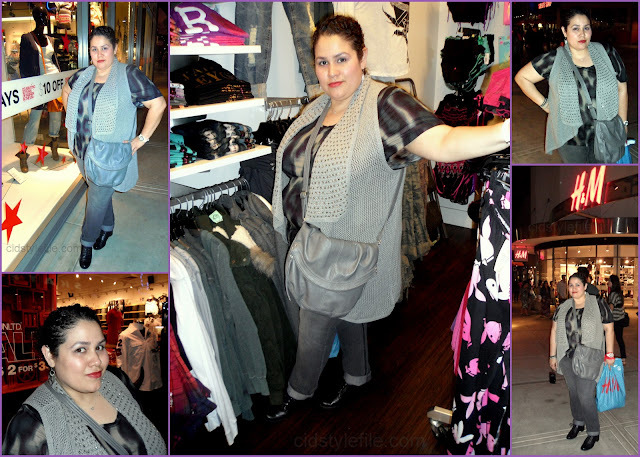 My boo and I went out for a evening of shopping and strolling at our favorite outdoor malls, The Block. I wore a completely new outfit (almost except the shoes). I was happy to be able to wear almost any shoes, except my flip flops or flats. My boots still won't fit over my chubby foot, well its not as swollen any more, but not 100% back to normal. I wore my new sweater vest with fancy beading from Lane Bryant, print top from H&M, and new skinny jeans from Torrid. I also got the gray cross body bag from H&M. I have been wanting a cross body bag, for a while now. When I saw this one at H&M I loved it and the price was even better ($17.95) It comes in gray, black, red and a brown (cognac) color. I got 2, gray and cognac color as well. Shoes are my good old oxfords from Natuarlizer from the outlet. What fall items are you looking forward to wearing? Have you started to wear you fall clothes yet? Tell me I really want to know! Thanks for your comments, thoughts and feed back! Oooo....I'm always on the hunt for crossbody bags that aren't tiny. That's looks great! Will have to check out H&M. Oh and it's good to see you out & about! You look great (and I love The Block but only get there when I'm in OC visiting family). Love the print top and sweater vest (I like the whole look you have going). I can relate to foot/ankle injuries. I'm working on my second. It seems like they take forever to heal. Okay... here's what is funny... i just read the post after my first comment. I have worn some fall pieces but not like I would like. With the weather I see in the upcoming week... I think I am going to be able to show how I make my summer wardrobe work for fall. My main thing is booties, tights, and jackets. ohh i like this outfit! you look great.